Reyna didn’t mean to become friends with Olive Barton. But when Olive kept talking after the lunch bell, Reyna didn’t say no, and she didn’t stop Olive when she followed her into the parking lot after school either. Olive is blunt, headstrong, and unapologetically honest—nothing like Reyna’s other friends, or anyone Reyna’s ever met. But as Reyna begins to drift apart from her childhood clique, she finds herself growing closer to Olive. Then Olive tells Reyna her secret, which changes everything. And as Reyna weighs her choices, she must find the courage to decide what really matters… before she loses Olive forever. This is the author's debut novel and it got a starred review in Kirkus. 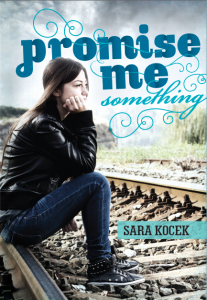 Add your review of "Promise Me Something" in comments! Thanks for posting. I started it earlier this week and couldn't put it down until finished. My mom (always curious to see what I'm reading) picked it up and now she seems to be hooked! This was a great read!